Enjoy each camping trip you take with this lightweight Falcon towing behind you. 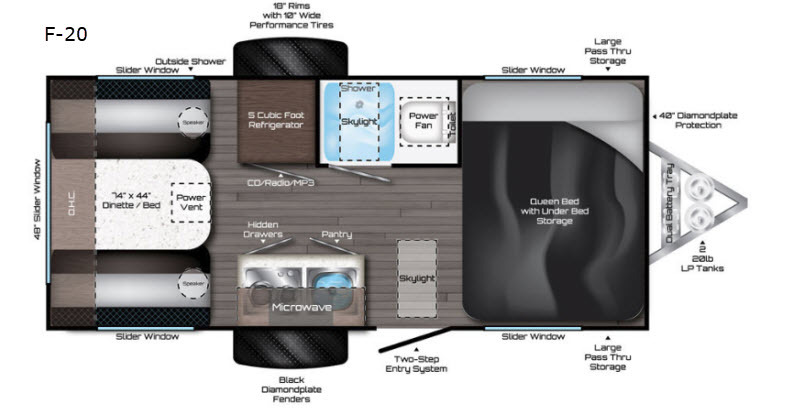 This travel trailer features everything you might need to enjoy spending time away from home. Along the rear there is a large dinette that can be folded down to a bed for additional sleeping space. You will love the front queen bed with storage underneath for your luggage or board games. The 5 cu.ft. refrigerator can hold all your cold items for the weekend, plus there are hidden drawers and a pantry for even more space. This model also features a wet bath so now you won't have to use the campground facilities. Bringing along extra lawn chairs and the tackle box is easier than ever with a large pass through storage in this travel trailer! 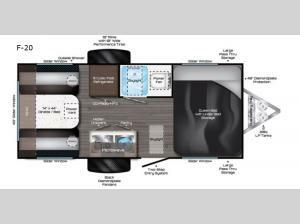 For a blend of style and ultra-lite you will want a Falcon travel trailer! The Falcon is one of the easiest travel trailers to haul! These models have an aerodynamic front and the exterior is a smooth aluminum. Inside you will enjoy conveniences such as a stainless steel sink and microwave as well as molded granicote kitchen counter tops and dining table, plus a quilted mattress for a good night's rest. The skylight above the shower and entry door adds natural lighting throughout. With each unit you'll enjoy an electric side awning, an outside shower, plus an AM/FM stereo with indoor-outdoor speakers so the time you spend outdoors with family is well spent.